Last week was an odd week around here. It was the last week of school this year for our two youngest children who just finished Kindergarten and 2nd grade, and then Saturday was our oldest daughter's wedding. There were a lot of things going on for both of these events as you might imagine. Besides all that, I had finished piecing my Red and Aqua quilt top and I was waiting for fabric to arrive in the mail to finish that project and for two other projects which I have yet to share with you. So I was kind of in limbo during my down time from end-of-school activities and wedding preparations. I decided to continue my quest for more empty space in my sewing room, and I found two jelly rolls I had purchased a while ago from the Connecting Threads clearance page. They were from their Riviera fabric line which is no longer available. So I opened them up and separated out the strips to see what was there. I had no real idea of what I would do with them, so I just started playing around. I used every strip in the two jelly rolls to create these blocks and laid them out in a way that I thought was attractive, making sort of a windmill design in the middle of each block of four. Until I unwrapped the jelly rolls, I had no idea what pretty fabrics were inside. The strip on the outside of each roll was that stripe you see in the orange blocks. I was pleasantly surprised to find the pretty florals and nice prints in such cheerful colors. I was able to make four 10-inch blocks from each 5-strip set, and since I had two jelly rolls exactly the same, I ended up with eight of each block. After piecing together the fabrics that I thought were obvious matches, I ended up with the last five strips that I pieced together and used for the backing. I didn't think these blocks fit in too well with the blocks I used on the front, so they became the focus of the back of the quilt. I found some other leftover Connecting Threads fabric for the pink border around the blocks. It is the fabric I used for the appliqué ribbon and lining on these quilted breast cancer walk bags. And I had some yardage of that awesome aqua fabric that frames it all so nicely. The aqua fabric is the only one that is not from Connecting Threads in this quilt. Not bad for five days of off and on sewing and no plan in mind, wouldn't you say? And it's reversible! 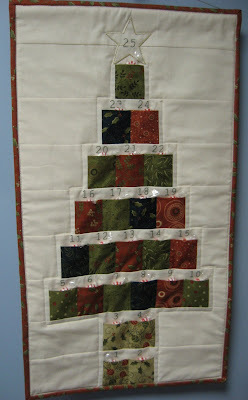 The quilting was done on my little old (and I mean old!) domestic Singer using simple straight line sewing. The batting was also a piece I had in my stash. This quilt ended up being about 40 by 60 inches, which is a good size for a throw blanket or a picnic blanket or even for in a baby's crib. The binding fabric is what I had leftover of Connecting Threads' Cheap Talk fabric that I used to make my daughter's cinch sack last year for our trip to New York City. You can see that bag HERE. I thought the colors went well with the quilt top colors. So now my little shelf of precuts has some empty space on it and my bin of yardage is a bit lighter. Better yet, I had something fun and productive to do with myself in between all the other activities of the week! Isn't it just a wonderful feeling to make something entirely from your stash! Especially something so nice and pretty! I feel that you can't have too many lap quilts or afghans, and I'm not even in a cold climate. Congratulations to your daughter. I bet she was a beautiful bride. Did you make any of her wedding wear? Love the quilt. Its great when you can get two quilts in one. Love your quilt - Congrats to the newlyweds. Will they be living close to you? 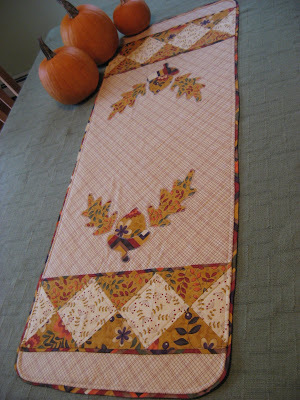 I happen to love reversible quilts! Colorful and pretty. What a gorgeous quilt!! Amazing for such a short time and no planning! !